Kate DiCamillo is the author of The Magician’s Elephant, a New York Times bestseller; The Tale of Despereaux, which was awarded the Newbery Medal; Because of Winn-Dixie, a Newbery Honor book; and six books starring Mercy Watson, including the Theodor Seuss Geisel Honor Book Mercy Watson Goes for a Ride. Kate DiCamillo lives in Minneapolis. Alison McGhee is the award-winning author of books for all ages, including Song of Middle C, illustrated by Scott Menchin; the #1 New York Times bestseller Someday, illustrated by Peter H. Reynolds; the young adult novel All Rivers Flow to the Sea; and the adult novel Shadow Baby, a Today Show Book Club selection. Alison McGhee lives in Minnesota. Tony Fucile is the author-illustrator of Let's Do Nothing! chosen as a Best Book of the Year by School Library Journal. He has spent more than twenty years designing and animating characters for numerous feature films, including The Lion King, Finding Nemo, and The Incredibles. He lives in the San Francisco Bay area. As in the previous books, the fresh, wry dialogue and Fucile's witty cartooning are as dynamic a pairing as Bink and Gollie themselves. Fans of Bink and Gollie will be pleased to welcome them back in three more humorous linked adventures that, as in their earlier appearances, play off their differences but ultimately affirm their mutual affection...Fucile’s digital artwork extends both the humor and the broad appeal. With wide-eyed, smiling characters, crisp black outlines and exaggerated details, they’re reminiscent of (really good) old-fashioned Saturday-morning cartoons. Just as in the first two series entries, the friends’ wildly different sensibilities—and their interests, both shared and disparate—tumble out through personality-filled dialogue and digital illustrations of barely contained chaos. 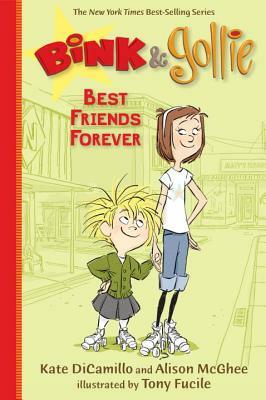 DiCamillo andMcGhee once again cleverly merge early reader, graphic novel, and picture book into a delightful ode to an unlikely duo...Droll, and with spot-on emotions, this return of the dynamic, roller-skating pair will make fans cheer. [T]he text (almost all dialogue) retains its comic joy as it veers between Gollie’s formal drawl and Bink’s ebullience. As usual, Fucile packs his lines with springy energy... The page design has the lively paneled momentum and theatrical views of a graphic novel, and it effectively partners with the few swift sentences per spread to move novice readers easily through the book.